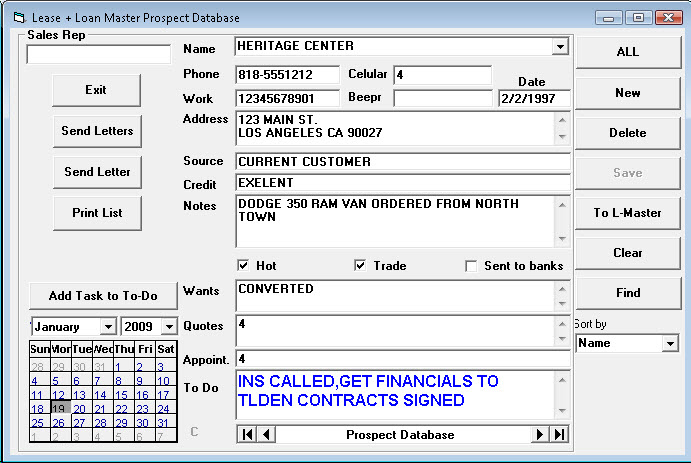 The Contact/Prospect Database is for maintenance and processing of your contacts that are not linked to a particular vehicle yet, this could be customers from a prior list or source that you are in the process of contacting. The Program can later send the prospect to the Lease or Loan Master for sales processing. The Callendar will permit scheduling reminders on the TODO file to follow up and manage appointments. The Program can also send Letters or Emails to your prospects. You can search using any of the information by filling in the boxes and selecting the find button.